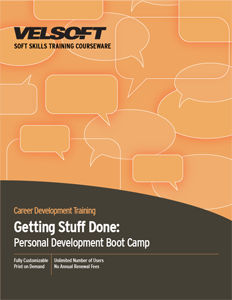 Personal Development Training Materials are designed for trainers to put employees and managers through a ‘boot camp’ on how to get stuff done in the workplace! Teach staff how to develop the right attitude, create a personal vision statement, create the right environment for maximizing efficiency, stop procrastination and more! Seeing is Believing This sample manual to teach Personal Development is in MS Word format. Did you know that 20% of your actions produce 80% of your results? It's called Pareto's Principle, and it's one of many techniques people use to increase their personal efficiency. For trainers who have been searching for a comprehensive personal development boot camp that goes beyond time management. Velsoft's Personal Development Training Materials is chock full of the most effective and efficient techniques to date! Velsoft's training material makes it easy to teach ways to stop staff procrastination, organize an office, set up an information management center, prioritize, and more! At the end of the course, students create a personal action plan that enables them to stay on track and implement what they've learned in the office to immediately take control of their work habits and capitalize on their personal development training. Trainers can also enhance their classroom-led instruction with eLearning, a web-based, blended learning solution that expands the classroom and makes personal development training even more accessible.